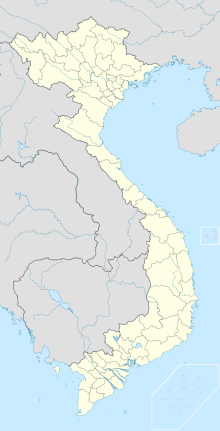 Buon Ma Thuot Airport (IATA: BMV, ICAO: VVBM) (Vietnamese: Sân bay Buôn Ma Thuột) is a public airport in Vietnam. The airport is located in Đắk Lắk Province and has one functional runway. A second incomplete runway (marked with a faded 27 R) is not in use. Two aprons are located on the south side of the airport with buildings that appeared to be used for aircraft storage. A barracks-like camp is located to the north side of the airport. This airport handled 860,000 passenger in 2016. ^ a b "Cảng hàng không Buôn Ma Thuột đảm bảo môi trường luôn "xanh-sạch-đẹp"" (in Vietnamese). ACV. 9 September 2015. ^ "Jetstar Pacific expands Da Nang service in S17". routesonline. Retrieved 27 March 2017. ^ "Vietjet Air Adds New Domestic Routes from May 2016". airlineroute. Retrieved 28 April 2016. This article about a Vietnamese airport is a stub. You can help Wikipedia by expanding it.